When it comes to celebrating our birthdays, A and I love to skip a big party and take an exciting trip together instead. After celebrating my birthday by the beach in Abu Dhabi earlier this year, we decided to spend a long weekend in New York City for A’s special day. 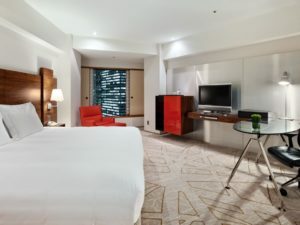 We now just needed to find the perfect hotel – not an easy task given the fact that New York Fashion Week and the US Open were taking place at the same time. After hearing great things about The Knickerbocker we decided to go with this 5 star hotel in Midtown Manhattan. Continue reading and learn more about our stay. As we only had four days in New York, location was one of the most important attributes when it came to our hotel choice. 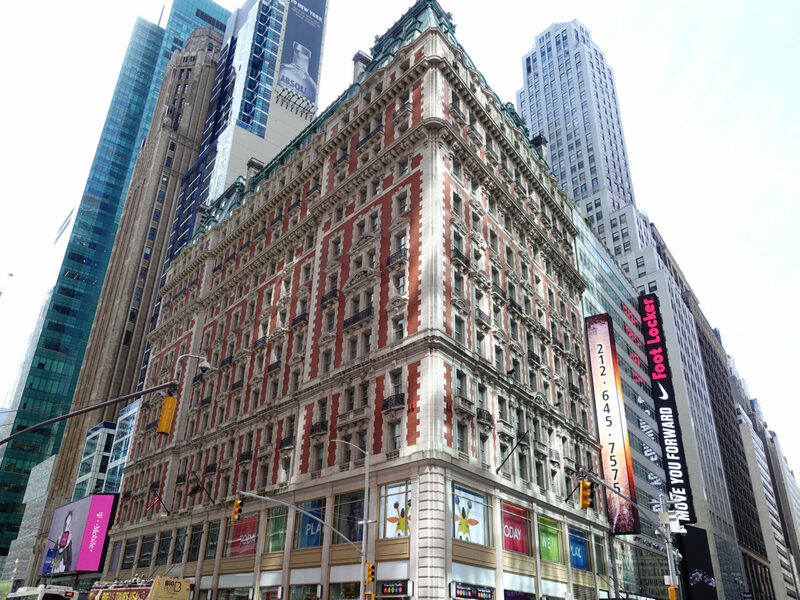 The Knickerbocker is located in Midtown Manhattan, nestled between Times Square and Bryant Park. For us it was the ideal location to explore Manhattan by foot or Uber. But the subway station and a taxi stand are just steps away from the hotel as well, in case you prefer that. We arrived around noon after a red eye flight from Frankfurt and I was surprised how calm and luxurious the lobby area felt – a huge contrast to the hustle and bustle of Times Square which is located just around the corner. The reception is hidden behind the elevator area, which some guests might find unusual but I didn’t mind. Our room was ready ahead of check-in time and the whole process took less than 10 Minutes. 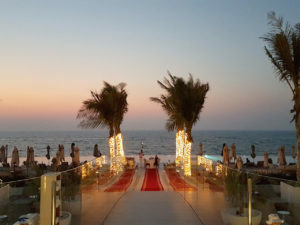 The reception team was friendly but didn’t really take the time to explain any details about the hotel or it’s dining options which again, is rather unusual for a five star property. The rooms are beautifully decorated and I loved the huge king size bed. We had booked our stay through Leading Hotels of the World where we enjoy member benefits. However we didn’t receive an upgrade this time. Instead we were given the keys to the Deluxe Room we had booked. The room was super spacious and bright which is very unusual for New York. The interior design felt very luxurious and modern with neutral and earth tones and a nice light concept. The Deluxe Room featured a super comfortable king size bed, as well as desk, a nice chair and a big closet. It was well light and offered partial views of Times Square, although being comfortably quiet given the central location. We received two complimentary bottles of water every day, which was a nice touch. No complimentary coffee machine though, which is usually a given at a five star property. 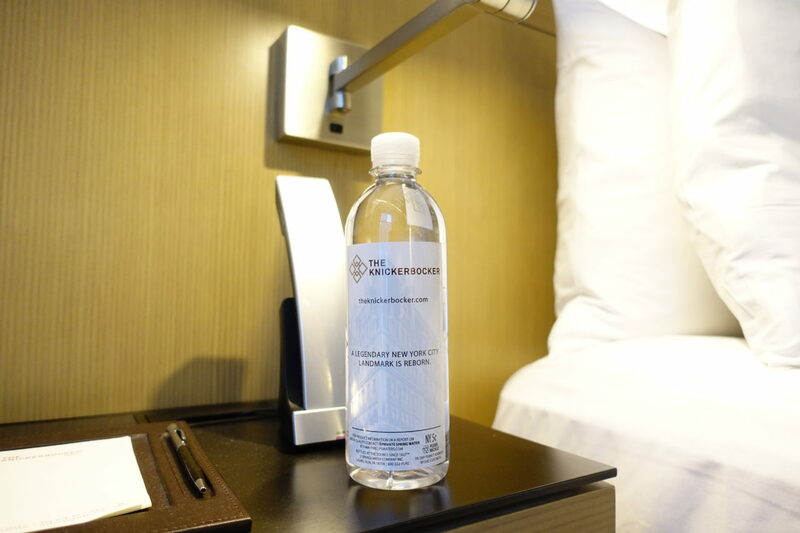 One complimentary water bottle a day makes sure to keep you hidrated. The bathroom was super spacious. which is not usually the case in New York City. 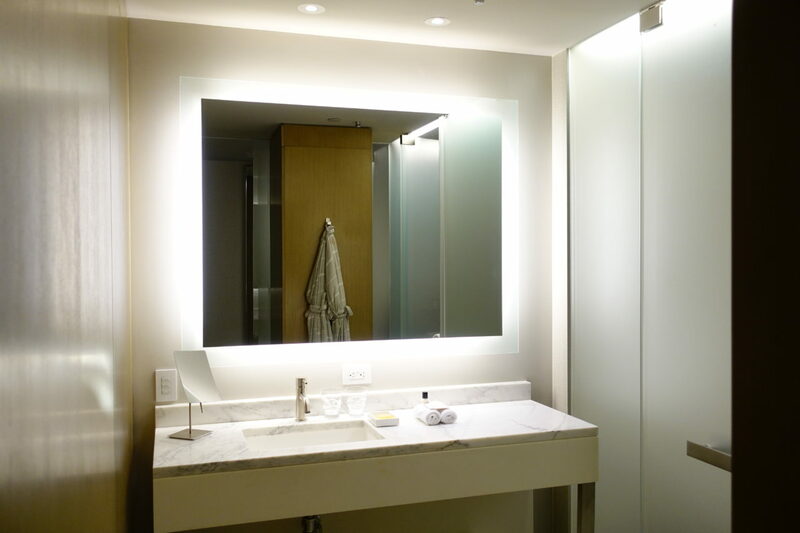 The best part of the room however was the bathroom – which again was extremely spacious offering a beautiful marble sink as well as a huge rain shower and a separate toilet. There were plenty of fluffy towels, slippers and bathrobes at our disposal. The amenities by Ted Gibson smelled especially good, although the hotel never re-filled them which felt a bit stingy. My only other disappointment was the hair dryer, as it was small and super slow – it took me ages to get ready. It’s a good thing that New York has so many Blowout Bars. When it comes to five-star hotels, the service often is what makes all the difference, don’t you think? Being used to the very attentive service in the US, the team at The Knickerbocker unfortunately didn’t manage to live up to my expectations. First of all, I had let the hotel know beforehand that our arrival day was A’s birthday. The hotel staff obviously also had it on file and mentioned it quickly upon arrival – but: Nothing else happened. No cake, no bubbly, no birthday card. Being used to be travelling during our birthdays and having seen, how much effort other hotels take, I found this quite disappointing for a five star property in the US. Also the turndown service, bellboy and restaurant experiences were rather inconsistent. One day the turndown would happen, the other day not. They always made one side of the bed but never both. Don’t get me wrong, the team was friendly at all times – it just felt as if there is still some way to go for The Knickerbocker to arrive at the luxury hotel category. St. Clouds is the hotels’ own rooftop bar and offers nice views of Times Square. Even if the service part could have been better, I loved the dining options the Knickerbocker has to offer. Due to our LHW Leader’s Club status, we had continental breakfast included in our rate. Breakfast was served in the hotels’ stylish restaurant “Charlie Palmer at The Knick” every morning. 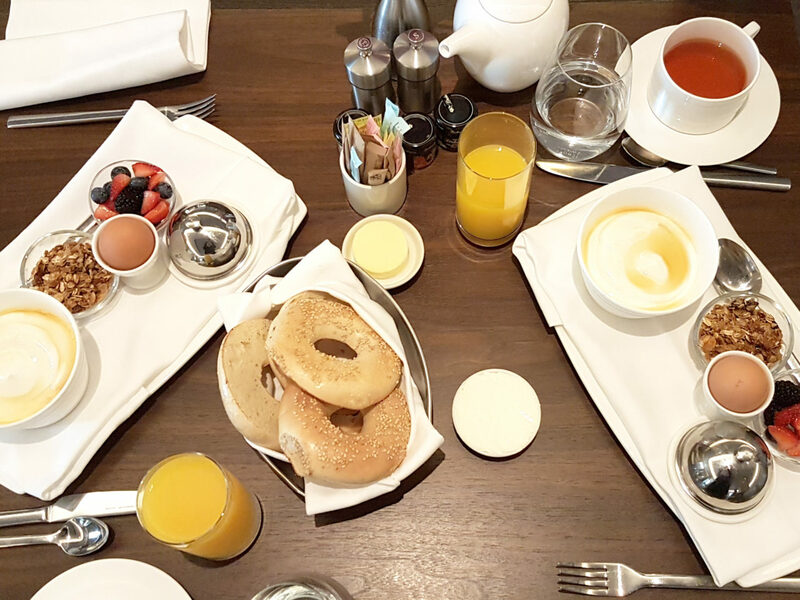 With fresh berries, granola, greek yoghurt, eggs and bagels it was a great way to kick off our mornings in New York. Coffee and tea options were great. The restaurant also offers a good dinner menu – something we will definitely try out when coming back to the city. Just like the rooms the restaurant also felt stylish and elegant. A nice way to kick-off our mornings in New York: Continental Breakfast at The Knickerbocker Hotel. The highlight however is the hotels’ rooftop bar and terrace St. Cloud, which we visited twice for delicious drinks and bar bites. St. Cloud offers great views of the Times Square and is the perfect place to mingle with New York afterwork crowd – as there are many locals visiting every night rather then tourists. Even if you are not staying at The Knickerbocker, you should make sure to visit their rooftop – I loved it! 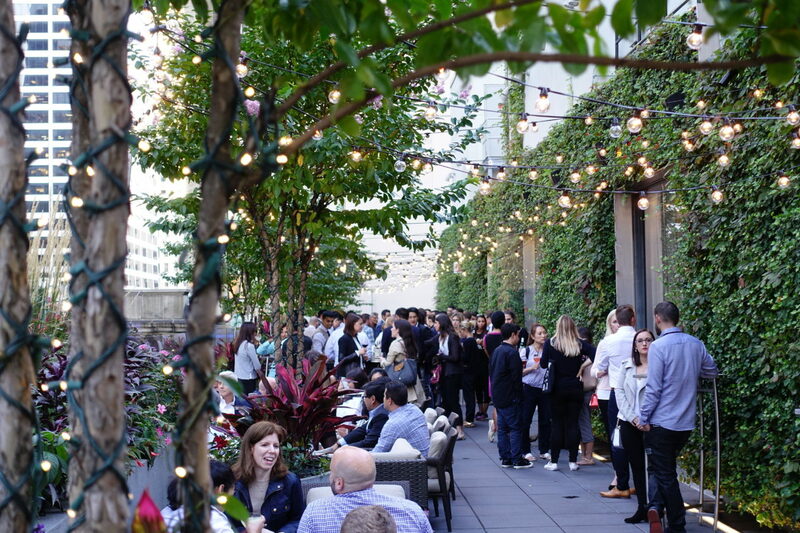 Nothing better than rooftop drinks and bar bites to conclude a day in New York. 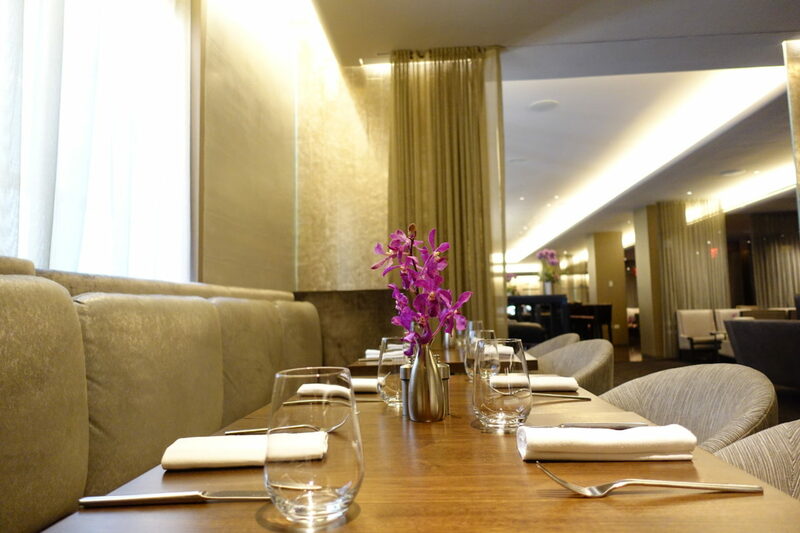 If you are looking for a stylish and luxurious hotel in the heart of New York The Knickerbocker is a great choice. I would definitely come back, even though I was pretty disappointed with the service. 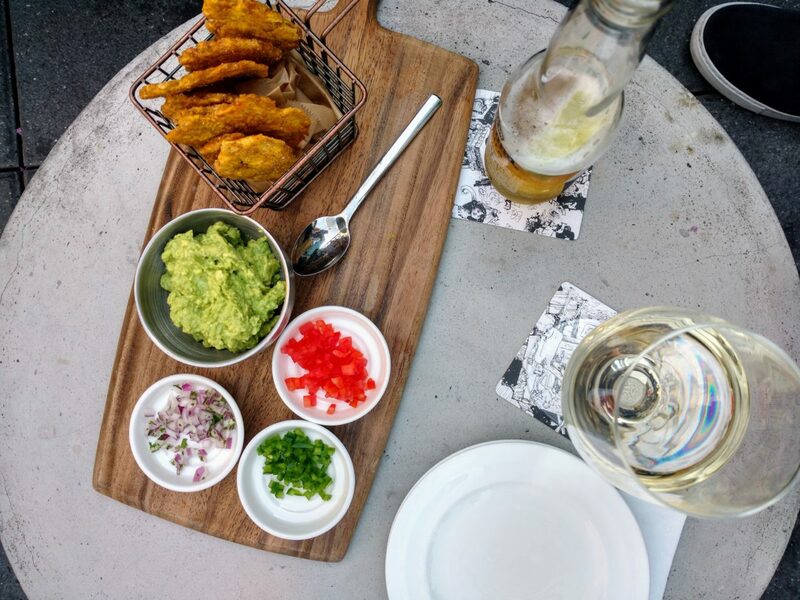 Great food, a great value for money proposition and a fantastic rooftop makes up for it. The “hardware” is modern and tasteful. 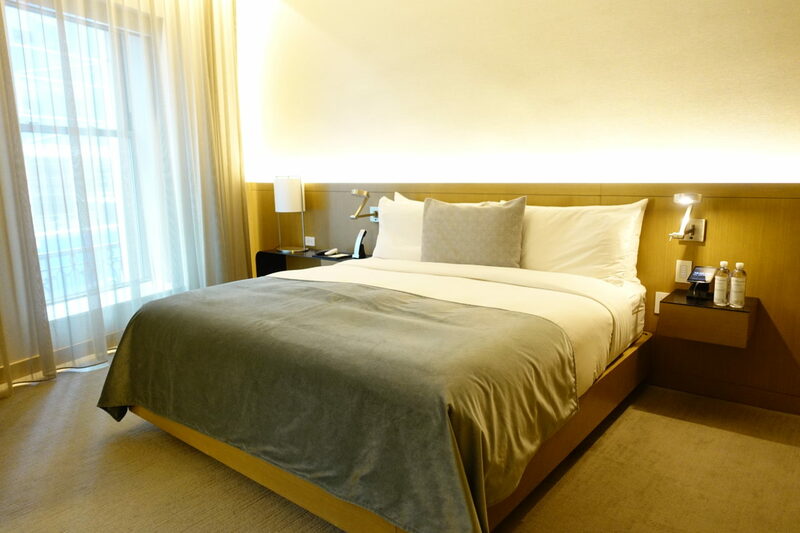 Also, I’ve never seen such a spacious room in New York City before – which is an absolute plus when it comes to finding your home away from home while visiting the Big Apple. Which is your favourite hotel in New York? I would love to read your recommendations in the comment section! Also, learn more about our travel to New York here.